After months of waiting and after significant delay, the camera hardware for the Raspberry Pi is now available at retailers for just under € 25 excluding postage and is almost the same price as the Raspberry Pi Model A. Several guides have also been posted as well as some examples of uses. 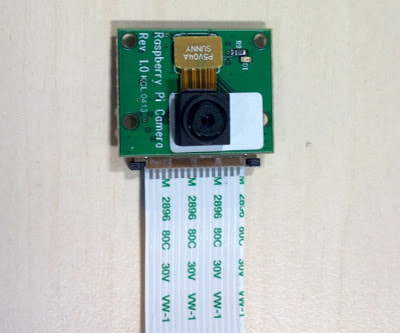 It has been nearly six months since the camera for the Raspberry Pi has made its first appearance for the general public, it was in November 2012 at the Electronica 2012 show. It was a question of finalizing the software part that was clearly not yet ready. This now seems to be the case since the two official distributors of Raspberry Pi and RS Components, offer this small module for sale. Rate side, it takes a little less than 25 € in both cases excluding postage. As a reminder, this optical sensor has a resolution of 2592 x 1944 pixels, 5 megapixels for photos. On the video side, the 1080p is supported at 30 frames per second (fps) and can go up to 60 fps in 720p and 90 fps at 480p.In order to exploit at best the Raspberry Pi Foundation offers us a short guide detailing how to enable support for the camera Raspbian the Linux distribution dedicated to this mini machine. You will also find some examples of how to simply capture a photo or video. For its part, the company has made a small DesignSpark video "Time-Lapse" which gives a small idea of what it can achieve. All about Google Nexus 4! The new Kinect will be available for Windows PC! The Brand New Google Wallet! You can chat with your Google Chrome soon!!! BitTorrent says “1 PB of data exchanged”! Future Supersonic Aircraft Tested by NASA! Latest details on the Google Tablet Nexus 11! A 3D screen Smartphone by Amazon! Acer Aspire R7 a notebook with touch screen! Youtube launches its pay offer from today! App Store Nearing 50 billionth Downloads! Epic Citadel in Firefox now! Google now focus on the game for Android? Ford Fiesta eWheelDrive- Car Engine on Wheels!